These pieces of art are just a few pieces you can select from if you name is drawn. But you have to answer the questions below. So I did put up a normal blog post today. I wanted to ask a few questions. I asked this question over on my Facebook page and want to hear from all of you from here as well. 1. Do you prefer to watch the videos at normal speed with commentary or do you prefer sped up sketches with no commentary. 2. What are your favorite things that I post… tutorials, inspiration.. like quotes and motivational stuff. Sharing my artwork or all of the above. 3.Then, is what would you add to my blog? a few suggestions might be highlighting guest artist, artist from the book, commenting on other peoples artwork with their permission of course. A podcast. Name some other stuff you might like. I really appreciate you taking the time for the feedback and it will help me to tailor what you all like out there. For all the people that participate in answering the questions will be put in a random drawing for a free piece of artwork from the store in $10 selections. I will draw 3 names on July 5th and announce them here. You will also receive an email if you win so I can collect you address. 1. It really depends on the content of the video. A video like the practice of ellipses required me to listen..though there’s nothing wrong with speeding up videos to watch the awesomeness happen. 2. I truly enjoy the sharing of your artwork, in my opinion that’s what’s it’s all about..then again, it’s all cool. 3. Not sure where I’m going with this, but maybe you could share customer to artist experiences, good, and bad. Industry do’s and don’ts. I’ve found personal stories really help aspiring artists like myself build a stronger foundation. Good stuff Nelson and hey you were the first to post, awesome! Yea I like the customer to artist experience. I have failed and succeeded lots of time so it would be great to share. 1 normal speed with full commentary. Seeing a person do it is one thing, but understanding the way they think takes it that much further. It’s the difference between showing and teaching. I will say though that I much prefer short tuts where you simply point us in a direction and leave it at that. 2 I love seeing your artwork: it inspires me to improve mt own. After that, the tutorials when I have the time to watch them. 3 I think you should add a section to your blog about other artists that inspire you. 1) I’m also an artist and a musician. I LOVE the commentaries. Since stories are how information has been shared in humans for eons, it’s nice to hear the “Why it came to be” or the “How I stumbled onto” type of stories. For me that type of information deliveries tends to stick in my brain more. 3) This is a tough question as a “blog” would contain information that the “blogger” would want to communicate. Again, the quick tutorials on better drawing/sketching skills are awesome. The idea on guest artists is a great idea as well. Maybe THEY could do a quick “improve yourself” type entry. You know, the kinds of things THEY do in practice. Oh! How about a series on mediums used. Ink on velum, pencil on paper and things like that. The “why” of the medium choice would be cool. I hope this helps. Again, I really enjoy your art. Nostalgic yet modern. I like that. 1. I like the videos at regular speed, with a lot of commentary, even if you are not necessarily offering step by step instruction regarding the process (although that is good too) I love to hear artists thoughts on things like subject matter, what motivates them, experiences, etc. 2. My favorite stuff is the tutorials and shared artwork. 3. I would love to see an addition to your blog where guests and nobodys (like myself) could share our artwork, I am a lifelong auto illustration enthusiast and a very VERY amature artist, I love to see the stuff that comes out of other artists heads/hearts. 1. I really enjoy slight speed up with commentary. I also enjoy normal speed with commentary. Either way I like when the artist talks because it lets me into your mind a bit. 2. All of the above. I really love the sketches most. Early stage art is my favorite and inspires me most! 3. highlight artists, especially up and comers (people you would like to work with.) I like Nelson’s answer a lot. As a artist recently out of school it would be awesome to read experiences in your career that helped you get where you are now. 2.- I think is the “all above” option, i mean, one is never in the same mood for chicken all the time right? adding the kind of stuff that goes through a colleague is always interesting. Tutorials are great, but some of your inspiration sources are also apreciated. And so on. 3.- What would i add? mmmmmm thats a good one, specially cause i know you are concerned to really work on it. So it has to be realistic yet useful. And i guess that would be: Tips on how to be a better designer outside your desktop. I mean, as a designer you tend to watch everything around but you can’t get everywhere. Another thing could be more of those personal advices on the sketches people send to you. That is just amazing to open up our minds to see what can we improve on. P.S. Don’t know if i had to write my answers here or in fb, so I’m posting this on your wall. 1. I like videos that have commentary. I like to know what the artist is thinking when designing. 2. Inspirational stuff because its cool to know when an idea comes from. And of coarse your artwork have loved your work for a very long time. 3. I definitely like see other artist work that you have found that you like or friends of yours like the ones in the books. Events that you attend. Projects that you my be working on. 1. I like normal speed with commentary, but an option of sped up w/out would be a good one. Especially for people who are only interested in the end design & not really the how-to. 2. My favorite posts are of course the artwork. 3. I would love simple tutorials. Especially for kids. My son (5years) LOVES to draw cars & simple things/ sketches would be a great inspiration. Also, I would guess for beginner artists they would be great also. 1. I’m really enjoying your “Improve your Sketches” tutorials. They are straight forward enough to be sped up and fully understandable. I am trying to learn how to color my sketches well on the computer, but all of the tutorials I find are sped up and too fast to follow. I realize that it would be a huge file showing a whole sketch and coloring, but I’m guessing one of your future tutorials will cover the basics of computer coloring. 2. As I mentioned above, I am thoroughly enjoying your tutorials. But I also gain inspiration from studying your work and the work of other people in the industry. 3. Your blog is going well. A section on other artists and contributors to your book sounds interesting. A new baby has sapped my spare time, but I really like seeing different peoples versions of the same car. 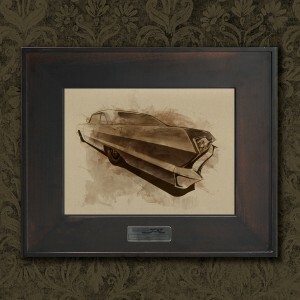 Maybe hold a competition every couple of months where you choose a semi-unique car, ’58 Pontiac, ’49 DeSoto, for example and people submit their artwork on that model. It doesn’t have to have prizes. Just an opportunity for people to submit their work and have other artists critique it. Keep up the inspiring work and put my name on a big piece of paper to increase my random draw chances. haha. 1. I definitely don’t speed the videos up. I always end up missing something if I do. 2.i love the tutorials, the little helpful hints and secrets. I’ve learned so much from trying the little exercises that you talk about. 3. I would love to see some work from artists that have influenced you over the years. Also maybe some of your early work so we could see the progression of your style. 1. I prefer normal speed especially with commentary since it’s good to see what you do but the why is also very important. it’s not just about learning about technique but the line of thought that goes through your mind while you’re drawing. 2. sharing you’re work is definitly one of them since it’s really inspiring and unique, tutorials also since it’s always nice to see how you got to that final result or skill level. Your inspiration are good also it gets everyone in the mood! 3. I would like to hear more about you and you’re drawing skill what do you do to push yourself on step further to be sure you keep you’re edge and become better. You could also make people participate, give out challenge and review them with commentaries or sort out a top 3 or 5 for fun maybe by pointing out the things that’s been applied that you talk about in you’re videos. It’s nice to see you’re taking you’re blog seriously and that you’re ready to invest time to be good quality. 2. As a perspiring… I mean aspiring artist, I would have to say I like seeing your tutorials the most. They keep me going back to the basics that so easily get overlooked. 1. I always watch videos twice, first time normal speed just for watching pleasure and not for “learning purposes”. The second time is sped up (even with commentary) only by x 1.5 speed on VLC player though which still means the commentary is understandable but this time i take notes. Taking notes has drastically improved my learning and i save to a specific tutorial folder in a “notes” subfolder with the title of the video as the note title. 2. Tutorials always tutorials, nothing inspires/gives confidence like a good tutorial, seeing someone do something you just havnt been able to do and having them explain it makes you feel like you can go away and do the greatest sketch you ever did right away and a million more in the future. 3. Podcasts, the thing i love about podcasts is what comes up unplanned sometimes, it may be a few sentences but those few sentences contain a tip or idea that we may not have thought about and you just spontaneously remembered, maybe you are talking about a sketch technique then you trail off for a minute about your room and how its set up or misc tips that you hadnt planned to say but you remembered during the podcast which are really helpful. I often start remembering extra things when i have to tell somebody about something that i just wouldnt have remembered in the planning process. Also podcasts are a way to keep people in touch with the website that may not have the time to get onto it regularly. Letting them know about whats happening on the site or what they may have missed so they can then go check it all out. 1.I would prefer normal speed with commentary , feels much more like you’re communicating with us. 2. Anything you share is good , you’re a great artist and seeing the way you work around the pad is inspirational in itself. However hearing about your life and how you experience your work keeps you grounded and more real :D.
4. Interviews are always good when you’re doing a blog for an audience. but otherwise just generally sharing what you can on work that you’re doing and program features that you learn. If you have time, breakdowns of your art and others could be cool. I really like the way that you’re laying out your tutorials as you are. A few sped up ones if the work has taken longer would be good as I don’t have much time in the mornings to view stuff that is hours long. Some of your thoughts within the narration of those would always appreciated too. I visit idrawgirls.com once in a while. that’s a pretty good benchmark or model for artists working digitally who are looking for a good tutorial too. I like it. Take a look if you haven’t already. I think that it’s important to do what you feel good about putting up here and on your Fb page. Your art is amazing after all and people not only admire and respect your artwork but you as an individual sharing what you know and have learnt with us. I’ll continue to check out your stuff coz’ I really like it. Thanks for asking mate and be well. 1. If you where doing a complete rendering I prefer pictures of each step, I find it easier and more relaxing to follow. On the other hand if you’re doing an ‘improve your sketches’ video I prefer normal speed with commentary. 2. I like pretty much everything. 3.Maybe do a sort of ‘talent scouting’, posting stuff from other starting young artist that you really like. 1. I think it really depends on the type of video. If you are actually doing a tutorial I’d like to see more videos at true speed with commentary. When it comes to just showing us your process or a new piece of art I like to see them in a speed painting style, much like you DS videos. 2. Again I’m happy to see a bit of everything. I really like the simple sketching tutorials, the line and ellipse tutorials were very helpful and as someone who has always used underlays in my drawings, your tutorials have really helped. I would like to hear about how you keep yourself inspired and motivated, I often get into a rhythm where I tend to draw the same style over and over to the point where I get bored and don’t feel inspired anymore. How do you get passed this? 3. Finally I would love to see some links and information about images and artists that you like and feel inspired by. Also information on where you get reference images from, do you set out and look for something in particular or do you just stock pile images that you come across online and photos you take? Also, I’ve never commented before I’m a massive fan of this blog. It’s really great to see that your not just posting stuff for the sake of it, you really seem to care about your fans and look to cater your blog to people like me! Chris Thanks for your comment! Thank you for kind words at the end. And yes you are right I am caring about my blog and love the fact that people are getting something out of it. I also appreciate the time people have taken to write back to me. It only helps me get better and to improve what kind of info you guys are looking for. 1. Normal speed is best with commentary. I can be a little slow on the uptake when it comes to catching on in sped up videos. Hopefully as I get better the sped up videos will be more understandable. If there is no commentary, then sped up is fine..
2. Tutorials, Quotes and Inspirationnal are all good. 3.Everything you suggested, plus some quick tips as time goes by on your favorite tricks with Painter and Photoshop. And Illustrator/Sketchup if you use them in any way. I like to see both within a video, normal speed demonstrating the steps, but sped up to complete a group of like-processes. Love having the details at normal speed with the commentary so we can see the work as it evolves. Love the learning tutorials as they inspire me to try new techniques, brushes, and mediums. Seeing your images is also inspiring very inspiring. As for suggestions on the blog, I love seeing your work and would really like for you to show them with explanation of how you achieved a background look, or why you painted a certain way. Maybe what brushes you used, why you chose them, and how you used them (techniques applied). Would love to see critiques of works, mostly the positive aspects of those works. 1. Sped up sketches with commentary! 2. I like the sketches, lately I’ve been blown away with the spaceships! The tutorials are great but I’m waiting for some more advanced topics. 3. 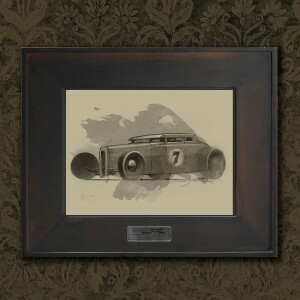 Interviews with Hot Wheels artists or people in the book would be great. I like behind the scenes stuff more than anything. Side by side sketches vs final work, maybe get multiple people to work on the same thing and see what you get (like a concept ship or robot etc). 4. Keeping a site fresh is really hard and time consuming. I like what you are posting in the blog. Don’t get burned out!! Thanks bud for your input. I won’t get burned out, this blog is really refreshing to do and I am enjoying every bit of it. I love the fact that people care enough to give me feedback which in return energizes me. So thank you for taking the time to write. 1. I think a mixture of speeds would be great, especially if you slow the tutorial videos down and comment on a technique, then speed back up to watch the process. The entire process of how you create your pieces is fascinating. 2. I frequent other artists’ blogs and keep tabs on Facebook so I can see not only a finished piece, but works in progress and inspiration. Chances are if something inspires an artist that I like, it will also inspire me. 3. Lettering tutorial? I’m a huge fan of hand lettering. LOL well I am not a lettering guy. I love that stuff too but that is not one of my strengths. Thanks for all your comments. 1. I prefer to watch the videos at normal speed with commentary, as they provide excellent information, which helps me learn, and understand the thought process and logic. 2. I enjoy a little of everything that you post, and having a variety keeps it fresh and interesting. Each post gives me an opportunity to improve myself and learn something new. 3. I would love to see challenges added. This can be a three part, interactive process. The first being viewer/members posting ideas for a challenge, and you select one to post. From there, other members can post their work (related to the challenge) and finally, members can vote on the posting(s) that they like best. There doesn’t have to be a prize related to the challenges, either but it gives people a chance to share their work. – A couple of ideas for challenges might be: 1) Create a tutorial that can teach a 1-4th grader how to draw a realistic tree. 2) Based on a drawing or photo of an unfinished item (the car in my URL would be a good example of an unfinished item), create a conceptual piece showing it in a complete state. In most cases video speed up wont hurt. What is needed in a commentry about what’s driving you to draw in ‘that’ particular way. Like Gnomon tutorials. I am a computer programmer and a muscian. I drew when I was little and now I am back to it again. Like every other artist I look for every thing(tutorial, inspiration…etc) that someone need to get started with his digital illustration. So, it all comes down the combination. There are a lot of other sites that are tutorial only, some are reference only. If you want to be a tutorial site like one of them out there, its fine. But, those exits. So, its abuot a little bit of personal touch, a try for not being someone/something else, its alway feels great when I know that this is not just a resource site, its an opinion of a person and what he like. Bottom line, motivate me draw with any kind of resource. Post something that’s intriguing. It doesn’t matter if its a quote or the latest illustration you are working on, or some piece of advice. Great input and thanks for the links. I had not come across that site yet. I will take a look at Andrew’s site. Thanks for asking us & for this opportunity to learn from your experiences. 1. I prefer to watch the videos at normal speed specially if there is detailed information. 2. All of the above is my favorite. 3. I like to post my works with techniques that I learned from you, as well as receiving feedback from others, this also will motivate others & new commers to MOCS world to see our improvement process through the book and the tutorials, by this they may like to be in the same learning truck. First, I have to tell you I’m not an artist, but I really enjoy your art. I am a motorhead from way back (well…I had the good fortune to grow up in the 60s-70s and was able to drive actual muscle cars off the showroom floors), and I still love automotive art. I started watching your videos and had to quit. Damn dude! You make it look so easy! I know that sometimes talent is cultivated over years, and sometimes it is just in your DNA… Wherever you got yours…it’s inspiring to watch you work. Oh, the reason I had to quit watching the videos? I was jealous that I have NO talent (artistic) and can not even draw a stick man the same way twice. Poor little bastards usually end up with half a head or only one leg. 2. Definitely love seeing your artwork the most. Actually I love the fact that you post the work of not well known artists. 3. Guest artist and a design competition would be awesome. 1. I prefer the normal speed with commentary. I like to hear the thought process while you are working. 3. There are some artists from the books that I would like to see highlighted. Maybe you could have us vote to decide who to highlight. Yea I think highlighting the artist in the MOCS Vol 1 and 2 would be great. I already have that planned. Thanks again for taking the time to fill this out. 1. I like normal speed video (or close) with commentary. It helps me learn from your methods. 2. I really like the tutorials and artwork, but all of it is interesting. 3. I would add more content from other sources, if possible. Guest bloggers are great. Additional eye candy from other sources is always welcome as well. Just received MOCS 2 last week. Awesome, just awesome. Keep up the good work! 1. I prefer normal speed video with commentary, that way we get some insight into your methodology as well as watch you do it at the same time. 2. Tutorials are my favorite, but I love to see your artwork as well, its all inspirational, and everyone benefits from the artwork and tutorials. 3. A video Podcast, that showcases what you are currently working on, as well as some other artists artwork that may have been influenced by your books, tutorials, etc. Other artist “Highlights” showcasing what others are doing in the “Car-Design” world would be cool as well, and would be a great networking tool. Blogs are great, but are eventually going to give way to Video Podcasts, You could upload them to Apple for iTunes and people could take the podcasts with them and automatically stay up to date with them as well. 1. Normal speed, commentary, perhaps some editing if you feel it’s getting too long in the tooth. 2. Tutorials of course! But it’s always great to see what inspires other artists. haha I was thinking of that before naming each day. Helps me to stay on track as well. Thanks for the feedback Kristina! 1. I prefer normal speed with commentary. I like the listening to the artist talk about his or her method and what they are thinking about as they work. 2. Tutorials are great. The improve your sketches are also very good. 3. Guest artist would be cool. Also I like how the jalopy journal has a friday art show maybe you could do something similar to let all your readers show their artwork as well. yes I love the Friday artshow idea. I am very new to the web stuff so I would need to figure out the logistics of doing that. I believe you can just post a pic right on the blog right? Those are questions I need to figure out. 1. I like them sped up, but not too fast. I can always rewind a little and watch over and over again (which happens at either speed really). 2. I like all the above, I like seeing your new stuff and love learning from your tutorials. 3. I also enjoy seeing new artists that have a love for all the same things we love! Maybe highlighting new and different artists? 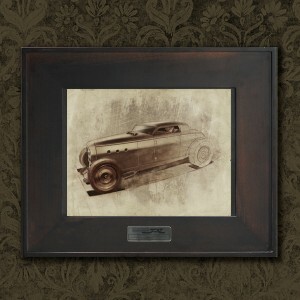 Say, like a jewelry designer that loves cars, motorcycles, and anything with a little history behind it! Hint hint! Ha!! Paul Glad your enjoying the book! I use Copic markers now but I also used to use prismacolor markers. Both are really good. Then for pencils I use mechanical pencils along with Verithins and prismacolors.